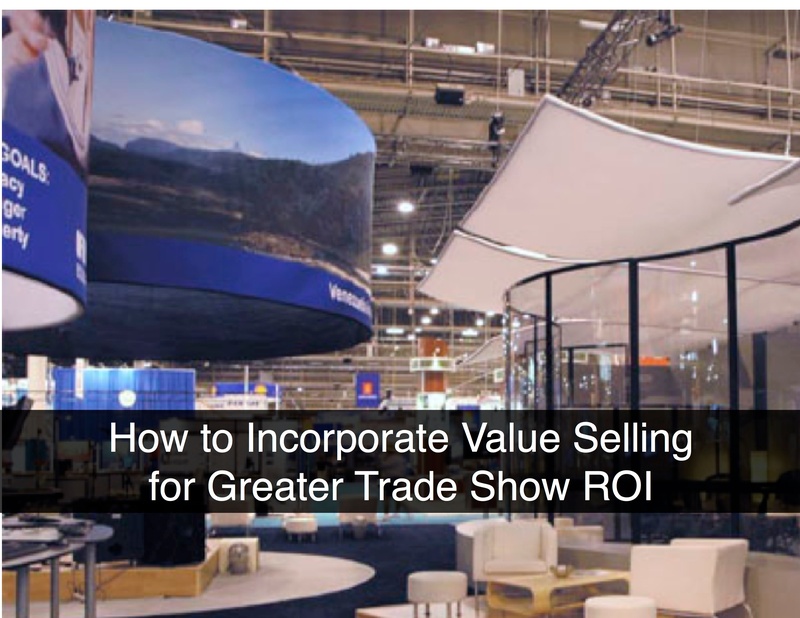 Applying a value selling methodology to your trade show program gives you something else you can offer to attendees that won’t take up any extra room in their carry-on, and that can dramatically improve your trade show ROI. Value selling, the process of helping buyers identify their pain points and quantifying how much your solution can help, has a role before, during, and after the show. It is critical to differentiate your approach prior to the show. Your competition is using the same, tired tactics over and over. Your ability to create a compelling reason for attendees to seek you out gives you a competitive edge. Strengthen your trade show promotion and outreach by including an assessment tool that helps attendees identify the size and scope of their business problems. You can also employ a value calculator that will help them gauge how your solution can make a difference. Incorporating these tools into your pre-show engagement will make attendees more receptive to meeting with you at the show. You will also want to ensure that all messaging from pre-show calls and emails -- to collateral and booth graphics are aligned with your solution’s value proposition, and that your booth visitors are familiar with your value message. This singular focus on business value appeals to buyers who care about solving their problems. Still giving away the usual swag to attract visitors to your booth? Ho hum... yet another tired tactic that makes your booth look like so many others. Here’s an interactive opportunity to use value selling tools to increase booth traffic engagement. You can make the same assessment tool or value calculator you used in your pre-event outreach available on a self-service kiosk. Not only will walk-up attendees be captivated enough to spend five to ten minutes with the tool, but they will get quick insight into the economic value delivered by your solution. Your booth representatives can also engage attendees with pre-scheduled appointments, as well as walk-ups using the same value tools on their mobile devices. This is a terrific way to qualify leads and inform prospective buyers on how your solution can solve their problems. Here too, creating differentiation is critical to filling your sales pipeline. Once attendees get back to the office, they are inundated with emails and phone calls from people they didn’t meet or barely remember. But you already have a built-in advantage: You created memorable experiences by introducing attendees to your value selling tools. Make the most of that by following up with value reports generated from the value selling tools, based upon each attendee’s inputs. Or advance the process even further and use an ROI tool to send attendees the business case for your solution. Trade shows are costly, and the only meaningful way to improve your ROI is to close more deals. Applying a value selling methodology to your trade show strategy helps convert attendees to customers. You can uniquely position your solution by focusing every touch point before, during, and after the show on the value of solving attendees’ business problems. You will get more meetings, higher booth traffic, increased leads, and better-qualified leads, resulting in sales growth.